Baby bibs can be fun and functional at the same time Our custom and personalized baby bibs make a great baby shower gift; they are sure to delight the mom-to-be. Our bibs are available in many different layout styles, patterns, prints, colors; They are easily customized to suit your needs. We also offer many different personalizaton styles - monograms, name & initial and all these in hundreds of different fonts. You can also upload your own design and / or photo. Our bibs are made from jersey polyester (feels like a soft tee shirt); have double stitched binding and double sided Velcro closure. The bibs are approximately 9.5" wide by 14" high. The bibs are digitally printed on one side using baby-safe inks. The reverse side is white. Want to delight the parent-to-be? Combine this bib, with a burp pad and a baby blanket, all in the same design and you have a unique, custom and personalized gift. Browse our nursery section to see all other available products available for baby. 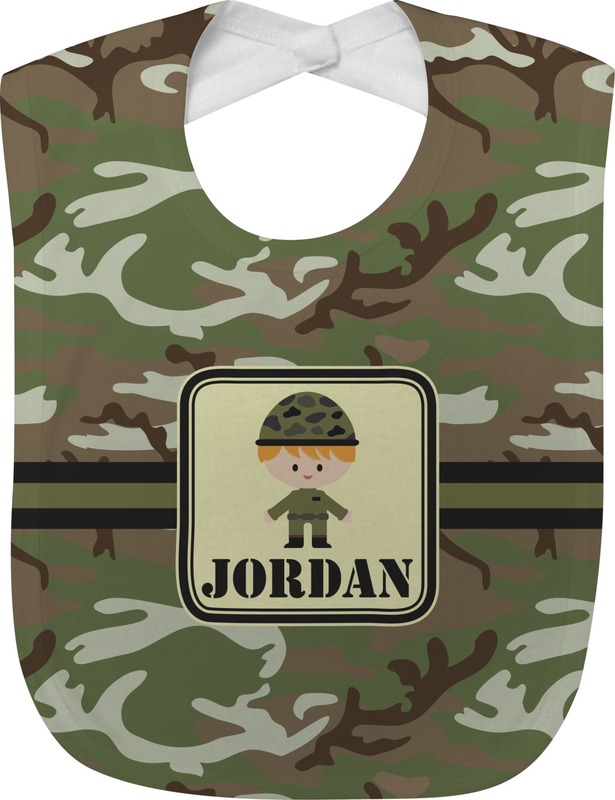 Bib goes with my other camo personalized items. Very pleased. I've been told that I have exhausted everyone's patience with the camouflage so I'm glad I got them all at once. This personal bib was really nice only one with anchors that went with our nautical theme. Thank You for having anchors as design.